Thu., March 8, 2018, 9:39 p.m. There are a number of days in Kailer Yamamoto’s young career that have made a lasting impression on his memory. There’s Oct. 22, 2014, the day he scored his first goal for the Spokane Chiefs. There’s Nov. 1, 2015, the day he played his first game with the U.S. national team in the under-17 World Hockey Challenge. And he can’t forget June 23, 2017, the day he was picked by the Edmonton Oilers in the first round of the 2017 NHL Draft. And now there’s October 2, 2017. That was just two days before the NHL season opened in Edmonton. Yamamoto had been working out at the Edmonton Oilers’ training camp, just months after they picked him 22nd overall in the draft. With the season starting soon, the 19-year-old Spokane-native figured he would be heading back to eastern Washington to prepare for his third year with the Chiefs. But to his surprise, Yamamoto would be staying for a while longer. That day he got word that Oilers head coach Todd McLellan wanted to have a word with him about the upcoming season. He would not only be playing, the right winger was called on to start in Edmonton’s season opener against the Calgary Flames on Oct. 4. Yamamoto had just more than 6 minutes on the ice in his NHL debut. That night he played alongside teammates Connor McDavid and Leon Draisaityl, two of his favorite players in the league, and he watched McDavid score a hat trick to beat the Flames 3-0. “It was really cool. That’s something I will never forget,” he said. Over the course of about a month, Yamamoto was living the posh lifestyle in and out of hotels and playing against some of the best players the NHL had to offer. As the month went on, he was allowed more and more time on the ice. He rounded up a season-high 22:20 against the Carolina Hurricanes on Oct. 17. Yamamoto picked up his first point with an assist on Oct. 14 when the Oilers fell to the Ottawa Senators. In a month, he had scored three points, all on assists. But then reality set in – Yamamoto had played nine games, the most he was permitted if the team didn’t want to burn the first year of his three-year entry level contract. The Oilers weren’t ready to bring him on full time, so they dropped him from the roster within a day’s notice. Almost immediately, Yamamoto was sent to Spokane to pick up where he left off with the Chiefs in the Western Hockey League. After a month of being one of the youngest on the ice full of hockey’s greatest mentors, he was back in his hometown as one of the oldest skaters at Spokane Arena and forced to adjust to a pace that seemed like child’s play compared to the NHL. Like so many athletes who get teased with a brief stint in the bigger leagues, Yamamoto had some mild readjustments to make. Those readjustments and the transition from the NHL back to a junior league were mostly mental obstacles, he said. For some players, the change in pace and the reality of losing out on a dream, even if temporary, takes months to process. Chiefs head coach Dan Lambert understands the process from his own experiences and from coaching in the junior leagues for several years. Lambert was bounced around the AHL and NHL and lower-level affiliates before he went to play professionally in Germany. He became even more aware of the toll such disappointments took on players when he first got hired in the WHL as an assistant coach and then head coach of the Kelowna Rockets. At that level, Lambert saw a number of hearts broken when young players were forced back to the Rockets after a stint in the NHL. One of those disappointed players was Draisaitl, who had been sent back to the WHL with the Prince Albert Raiders and then traded to the Rockets after playing 37 games with the Oilers. Draisaitl’s transition back into the junior league was also one that took some time and mental tunings. In his first night back with the Chiefs, Yamamoto had four points, including a goal, in a 6-3 rout of the Lethbridge Hurricanes on Nov. 10. But then Yamamoto went cold. For several games after the win over Lethbridge, he struggled to make a mark on the stat sheet. It took him more than a month before he finally got another goal on Dec. 12, his last game of the year with the Chiefs before heading off to play for the under-20 USA team. In that month, Yamamoto had eight points in 13 games, including his assist and goal on Dec. 12. 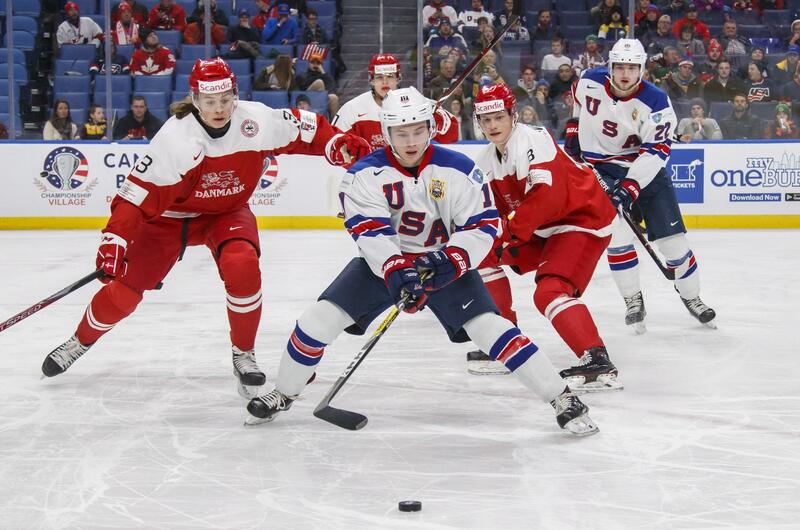 Yamamoto left Spokane at the end of December and headed to Buffalo, New York, where he played in the 2018 World Junior Championships, his third time playing for Team USA. In seven games he scored four points (two goals and two assists) to help the U.S. to a bronze medal. International play seemed to have reignited his fire when he returned to Spokane in the beginning of January. Since his return, Yamamoto has totaled 49 points in 29 games, including a goal in Spokane’s 5-2 win over the Victoria Royals on Wednesday. He has scored a point in all but three of those games. Now Yamamoto said he’s looking forward to ending the season on a high. The Chiefs have six more games in the regular season, three at the Arena. Their final three-game homestand begins with the Yamamoto bobblehead giveaway on Saturday against Vancouver at 7 p.m.
Then his focus will shift to getting back to Edmonton to stay for good. Yamamoto has yet to score a goal in the NHL, and he plans to check that off the bucket list soon. Published: March 8, 2018, 9:39 p.m.